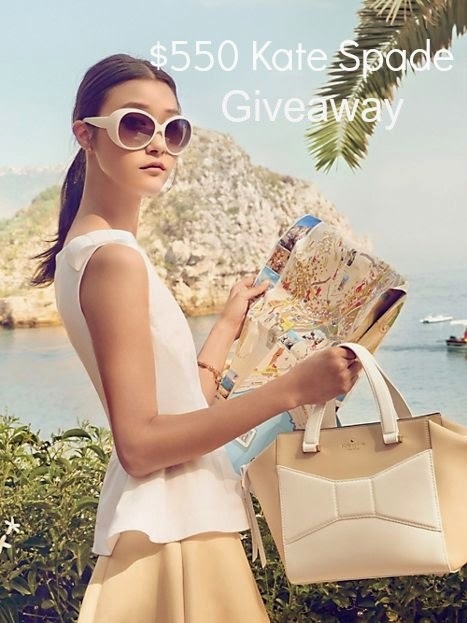 Today I am teaming up with 32 other fabulous bloggers to bring you a $550 Kate Spade giveaway. Yep, you heard that right. $550 split between two very lucky winners, to use at any Kate Spade online store. The great thing about Kate Spade, is that it's not only a great place to shop for your every day fashionista, but also for all you mommies out there. They have diaper bags ladies! I am drooling over this giveaway! I would totally get a new Kate Spade diaper bag for our upcoming little one! I'm not necessarily more worthy than someone else to win this but it would be really cool to win. I haven't won anything like this before and money's tight right now so otherwise I just screen shop Kate Spade and covet all the things I'll never own. I am a poor college student so I would absolutely die over something nice to add to my wardrobe!